“Double 11” day (11/11) is also known as “Singles Day” in China, as the four number 1s symbolize being alone. Single’s day, first invented by post-90’s kids, eventually became a sort of anti-Valentine’s Day around the country. To non-Chinese speaking communities, this might be just another day. However, to businesses based in China today, November 11th is one day where turnovers can easily approach one billion yuan. The day is treated with such significance that it is almost sacred. The transformation from a day celebrating singlehood to a day where shopping craze in China is in full swing, all began in 2009 when Tmall.com (under Alibaba) raked in about RMB50 million of sales within 24 hours alone. During this year’s November 11 strategy conference, Daniel Zhang, Director and Chief Executive Officer of Alibaba Group, elaborated on the beginnings of the day which hold so much significance today to businesses today, stating, “Back then, Tmall was known as Taobao Mall. Businesses were in much smaller sizes, and few knew about the Singles Day. Our thoughts were initially to create a day where consumers can have fun shopping, and we began to create a online shopping festival. The marketing went along the lines of ‘Have nothing much to do on Singles Day (November 11), so go buy something as presents for someone’.” He added further that, they chose November for two reasons back in 2009. First, it was due to change in seasons. The second was due to the lack of a holiday in November. “The reason we chose November to do this was because seasons are changing during that month. The south was in late autumn, while the north was entering winter. 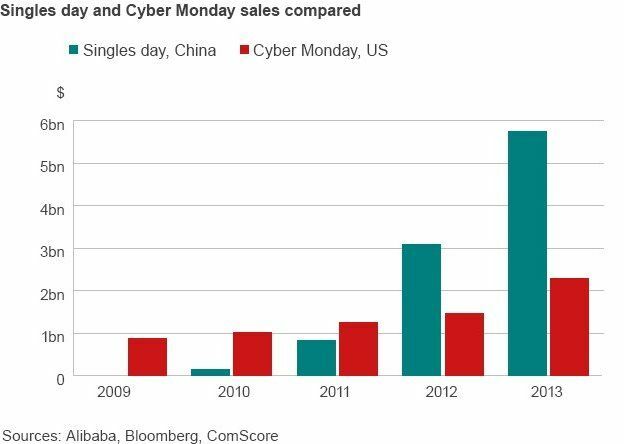 In this period, there was the Golden Week in October and Christmas in December, both of which saw heightened sales volumes, but none in November.” Turnover for Tmall skyrocketed to about 936 million yuan in year 2010, and further, exponential growth to RMB5.2 billion in year 2011. But despite obvious commercial potential, many businesses were still reluctant to join in. The shopping craze did not become “official” until year 2012, where turnover was recorded at RMB19.1 billion, and businesses by large and large finally recognized and treated the day with full respect. November 11 sales volume at Tmall continued to see exponential increase in subsequent years, raking in RMB35 billion and RMB57.1 billion , in year 2013 and 2014 respectively. Among all brands rushing to cash in on November 11 the shopping craze, none fared better than Xiaomi Inc., a Chinese electronics company founded in 2010 and recently has risen to become the world’s valuable technology start-up, after raising $1.1 billion in its latest funding round. Within 3 minutes after the sales began at midnight, all available stocks of the company’s M3 and Redmi mobile phones were sold out, raking in more than RMB100 million, and at the same time became the first brand to do so in year 2013. Well stocked the following year to handle the next round of November 11 craze, Xiaomi Inc. managed to rake in about RMB1.5 billion last year. Due to its notable growth in sales volume as a relatively new company, it became the next most noteworthy company after Tmall in this year’s shopping craze. According to Nielsen Corporation’s latest report after conducting a survey on more 1000 internet users in China, 56% stated that they will spending more than they did on the same day last year, and the average projected spending of all respondents was recorded to be RMB1761, which was an increase by 22% compared to last year’s data. According to yet another media report, more than 180 thousand shops and more than 1000 brands in 330 cities in China, were ready to participate in Alibaba’s online sales. More than 5000 foreign brands from 25 countries were also ready to cash in on the craze. Emboldened by exponential rise in sales volume every year since 2009, Alibaba will hold “Double 11 Tmall Carnival Night” on the eve of the big day itself at the Beijing National Aquatics Center, or better known as the “Water Cube”. The company will also give out more than 100 million red envelopes (hong bao) of varying amounts (the highest of which at RMB1111) and shopping vouchers worth more than RMB3 billion in total, to fuel this year’s Double 11 shopping festival. Despite facing fierce competition from notable competitors such as JD, Gome, and Suning, as well as other online malls joining in the fray less than 3 years ago, it is now anyone’s guess if Tmall will hit its sales target for November 11, 2015, which is set at RMB80 billion, at the end of the day. Amazon.cn (no VPN required in China) also plans to take part in addition to it’s own Black Friday sales this month.